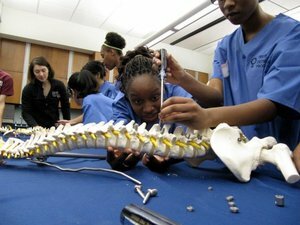 The Perry Initiative is committed to inspiring young women to be leaders in the fields of Orthopaedic Surgery and Engineering by sponsoring hands-on outreach programs across the country for high school women. The Perry Initiative is committed to inspiring young women to be leaders in the fields of Orthopaedic Surgery and Engineering by sponsoring hands-on outreach programs across the country for high school women. To learn more, visit the Perry Initiative website.